If you are a Early Stage Startup, your chances are of getting VC or Private Equity funding is very slim and numbers prove it – Only 9% of all the VC / PE deals have been for early stage companies between 2004 to 2008. This is especially true during the times of recession. Venture Capitalists play it safe and hardly venture in funding a early stage startups. These are the findings of “India Venture Capital & Private Equity Report 2009”, created by Thillai Rajan & Ashish Deshmukh of IIT, Madras. 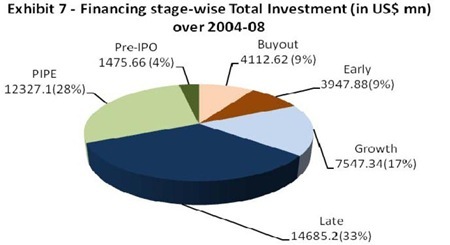 The report analysis in detail the venture capital and Private Equity funding in India between 2004 to 2008. India had seen tremendous growth in overall Private Equity funding (2008 was exception due to downturn) – In 2004, the total value of PE deals was $1.8 billion which grew tremendously to $22 billion in 2007 and then falling down to $8.1 billion in 2008. Out of the total PE VC Investments, around 50% went to Growth and Late stage companies. 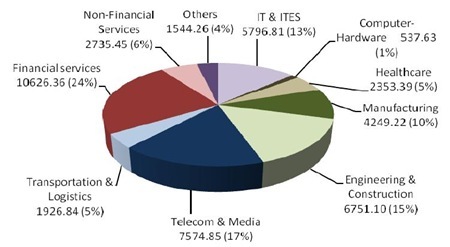 Financial Services Sector (24%) got the biggest share of Investment, followed by Telecom & Media (17%), Engineering & Construction (15%) and IT & ITES (13%). While the Financial Services sector lead in the total PE Investment amount, IT & ITES sector (20%) generated maximum number of deals followed by Manufacturing (17%) and Financial Services (13%). Like mentioned earlier, the Early stage Investment saw biggest drop (90%) in 2008 due to downturn, while the Late stage investment was relatively unaffected. If you need the complete report giving in-depth analysis of all the Private Equity deals executed between 2004 to 2008, please drop in a comment. Is this enough to curb corruption in India? The deadlines for Events of Management Module in Techniche’11 have been extended. The new deadlines are. 1. Product Launch – 5th Aug.
2. BrainChild (B-Plan Event with Rs. 50 Lakh incubation) – 5th Aug.
4. Blue Chips – 20th Aug, and can be registered on the spot. 5. VSM – The online stock market Simulation, can be played right now. The deadlines for Events of Management Module in Techniche'11 have been extended. The new deadlines are. Also do not forget to check out the mind blowing Lecture Series at Techniche." Looks like a great report. I would like to get the full report at the id mentioned here. Thank you! from the graph can seen that early adopter is less. Follower a lot. this seem like followers success more than early adopter because follower can learn mistake from the early adopter and improve it. That why higher chance to stay longer in market. Interesting report. Can I ve a copy of it? Great report. Would like to read the entire report. Great report ! Would like to have a copy of the report. Wonderful report. Can I get a full copy of it? Thank you. “India Venture Capital & Private Equity Report 2009.Great work.. I am in the pipeline of completing my thesis work on ‘private equity and health care sector’.It would be of great help if you can provide depth analysis off the Private Equity deals executed between 2004 to 2008 in India and majorly realted to Health care sector…. would love to know more. Thanks !! I am an MBA student currently researching the PE industry in India. It would be great if you could mail me the report at the given email id. I am looking at enetering the VC investment space in India post MBA and hence would like to learn more about the market. It would really help to read the report in detail. i request you a copy of VC report as i am dealing with the project titled “Growth of venture capital and its impacts on global recession”…hence a copy of this report would help me a lot….. I am a graduate student in Cambridge, MA and I am working with my team on venture capital in India. Can you please email me the report at [email protected], it would be very helpful to review the work on VC from IIT. Congrats on a great effort! I have been tracking the PE scene in Power sector closely but would love to understand the overall scenario in India. Request a copy of this fantastic report. Thanks. Trak.in is really good and very helpful.I would like to have a copy of the complete report as I am doing a study of penetration of VC fundin in India. Would like a copy of the report. Can you please send me the soft copy of the report. It will be highly appreciated. I’d appreciate it if you could email an electronic copy of the report to the email address listed in my profile. Can you please send me the report. Appreciate your cooperation. Quite interested in the role of private equity in India. Would very much like to have a copy of your report which is the source for the above information. This blog does not specify your mail ID so better mail us [email protected] so that we can send you the report. Iam studying the early stage vc investmnets in India. It will be very useful if you could mail a copy of the report to me. Would be glad if you could please mail a copy to [email protected]. Please mail me copy of India Venture Capital & Private Equity Report 2009. This seems very interesting..
let us know the link we can download this report from? It would be very interesting to read this report. Could you please email it to me? trak.in is an excellent attempt to help indian entrepreuners. Appreciate it. This is a really useful report as I am currently studying the penetration of VC fundin in India. It would be great if I could get a copy of the complete report. A copy of the report would be nice to read.